Warlock's Boomsday Project class legendary has been revealed, and it could be tricky to get rid of. The Boomsday Project, Hearthstone's next expansion, is only a week away now—so start getting ready to build some new decks. 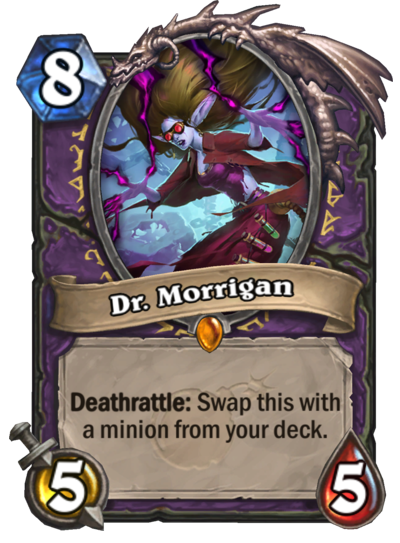 Dr. Morrigan is an eight mana 5/5 Warlock legendary minion. When it dies, it swaps itself with a minion from your deck. Assuming this works as it seems to, Dr. Morrigan doesn't actually die. It returns to your deck when it's killed, and summons a random minion from your deck. This fits most likely in slower Warlock decks, with cards like Voidlord and Mountain Giant available to be pulled out. Of course there are drawbacks. You could pull something tiny like a Kobold Librarian, or a Twilight Drake with no health buff. Time will tell if this is good enough for existing archetypes, has a new deck type built for it, or just isn't good enough to make the cut. The Boomsday Project is the second expansion of the current Standard year, the Year of the Raven. It will add 135 new cards to the game, including new keywords like Magnetic. It is currently available to pre-order, with all the cards becoming available on Aug. 7.